The Newberry Tablet’s authenticity, like all inscribed artifacts found in North America, is much debated. The best place to see it as it exists today is to watch Scott Wolter’s episode in America Unearthed. Virtually destroyed, there are few pictures of it in existence. The best pictures are in Roger Jewell’s book, “Ancient Mines of Kitchi Gummi” which is a well thought out explanation of the copper mines in the Lake Superior area and worth reading. 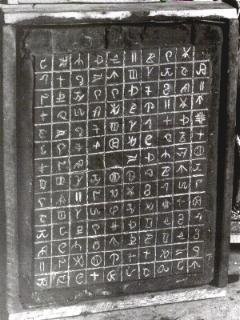 The translation done here of this tablet begins with looking at the square grid as essential to its meaning. The Earth is divided by longitude and latitude in a grid like manner. This then gives a starting point for translation. 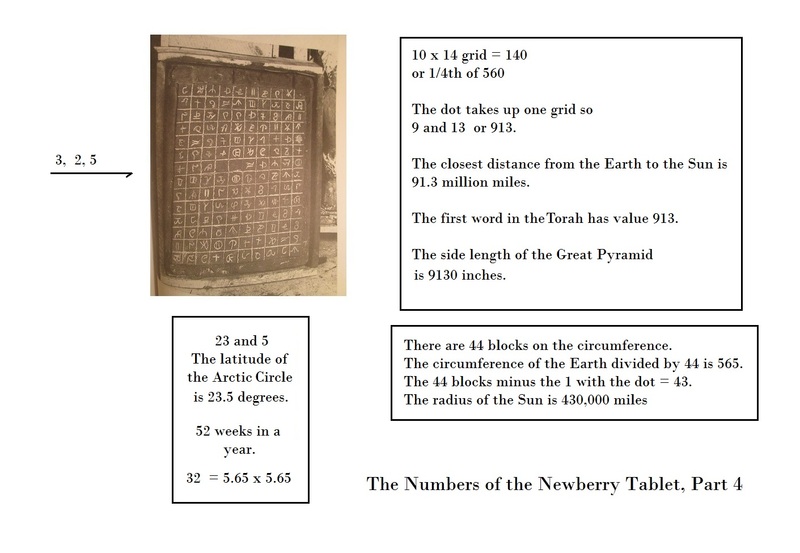 The numbers revealed by the grid are the same as those found in studying the Adena Tablets. It is highly unlikely a modern trickster would have known to incorporate these same numbers and this suggests the Tablet was authentic. In the coming weeks the meaning of the 138 (twice 69) symbols will be explored but for now ….. the numbers reveal a great deal! The tablet is a 10 x 14 grid. Here in the first image, notice that the upper right corner only has a dot or an eye. There are two empty boxes in the middle. Counting from the left and then right obtain 5,6 for the right box. Count it again as if the box is translated left 5 spaces and down 6 spaces so that 56 is obtained again. In this case, if the dot is at 1,1 it has translated to 5,6. Other numbers can be found depending on how one counts such as 7,8; 6,7; 7,6; 4,6; 6, 4; 7,8 and 7,7. 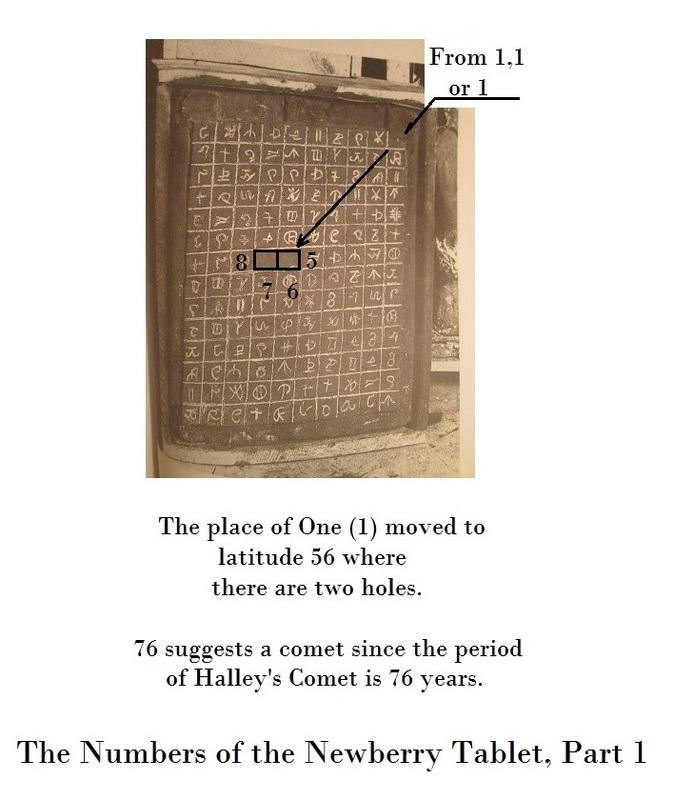 In this grouping notice 76 and 77 both appear and the return period of Halley’s comet is 76 to 77 years. Combining the two ideas it suggests the pole moved to latitude 56 because of a comet. This interpretation will be supported by further study of the symbols. The next number study reveals the grid can be divided by the central boxes into sections. 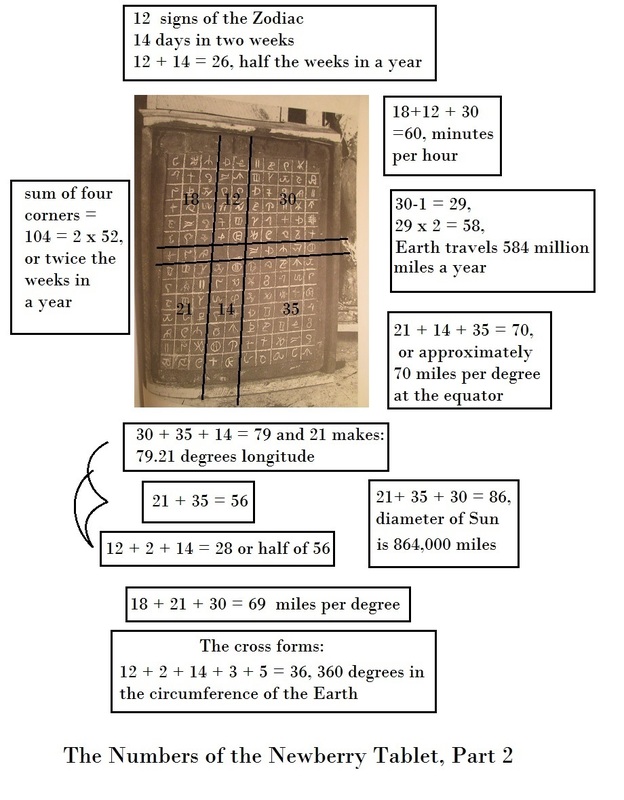 The number of boxes in each section are indicated and sums of these numbers reveal Earth related values. The three most plausible numbers from this study are found in the cross, top and bottom. The cross has 36 boxes which suggests the 360 degrees of longitude, 360 seconds in a degree of measure, and 360 seconds in an hour. The top has 60 boxes suggesting the 60 minutes in a degree of latitude and longitude. The bottom has 70 boxes suggesting the 69.2 miles per degree of longitude at the equator. 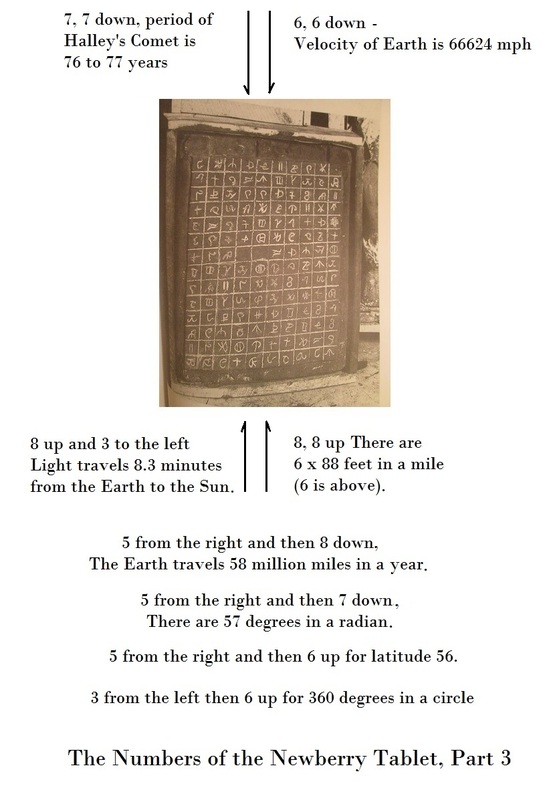 The third and last figures both reveal Earth related values and that the positioning vertically in the grid of the empty boxes was intentional. Finally, note the overall 10 by 14 grid. Recall the square root of 2 is 1.414 and note that 14 x 10 assembled as 1410 resembles this number. The story this tablet reveals continues in coming posts. Next up then is the beginning study of the symbols. This entry was posted in American History, Ancient History, Mysteries, Native American, Religion, Science, Uncategorized and tagged Adena Tablets, Baal, Luwian Hieroglyphs, Neolithic art interpretation, Newberry Tablet.